*This post was created in partnership with Omaha Steaks, and all the views and opinions expressed here are my own. 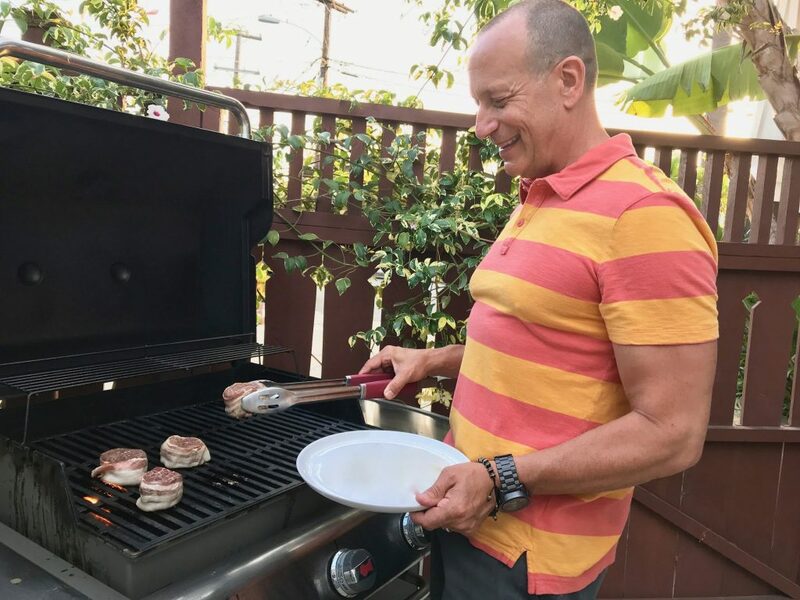 My pop taught me his barbecue skills when I was a teenager, passing on the age-old tradition like it was some manly ritual dating back to the cave men. Among his many lessons were solid recommendations on how to cook a chicken breast without drying it out, or how to put the perfect char on a hot dog. However, the one thing he did not teach me was how to barbecue the perfect steak. Honestly, I think he did not know how to barbecue the perfect steak, and used mostly a keen sense of hunger to determine how long the damn steaks stayed on the grill. He passed on absolutely no skills in this area. He also clearly knew nothing about ordering quality meats from Omaha Steaks. I had to learn all this the hard way. Demonstrating how to barbecue a steak, I’m grilling up some delicious Omaha Steaks bacon-wrapped filets. No joke, the quality of your meat makes a huge difference. If you bought your steaks from the bargain counter at a gas station, you should expect them to be tough and taste lousy. However, when you are willing to spend the proper amount to buy premium cuts of meat from a high-quality source like Omaha Steaks, you can expect the best in flavor and consistency. That’s why we don’t fool around. When we eat steaks, we prefer to order them from Omaha Steaks because we know they will taste amazing. The more marbled the meat, the better. Enough said. 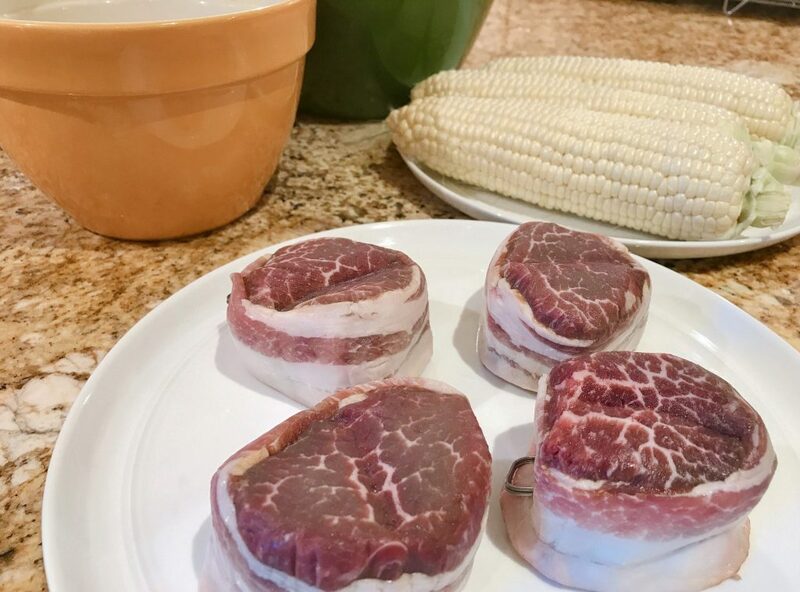 Look at the marble on these premium Omaha Steaks bacon wrapped filets! 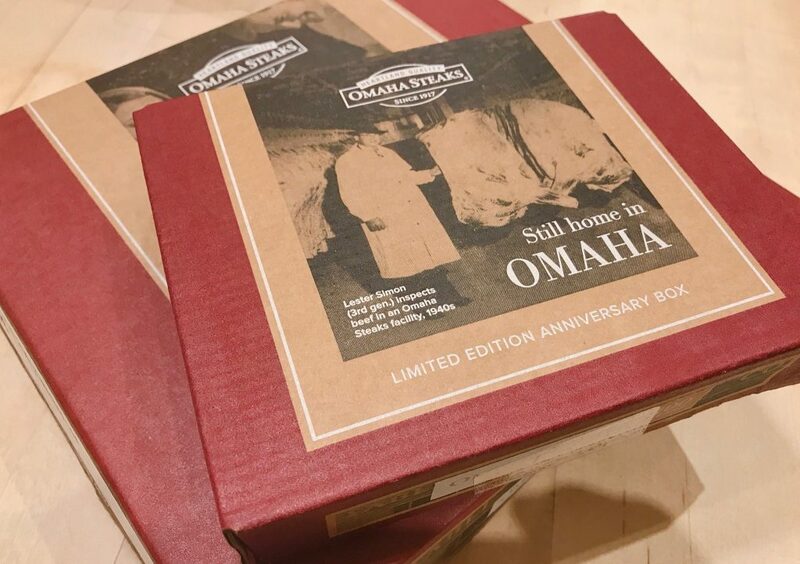 Whenever we see these distinctive red boxes with the historic photos, we know they contain quality Omaha Steaks products. Make sure the barbecue is VERY hot. Clean the grill with a steel bristle brush, careful to get off all the little leftover bits. Turn the heat down to medium-high (if using a gas grill) or wait for the charcoal to burn down a bit. Cut an onion in half, and dip it cut-side down into a bowl filled with a little olive oil. 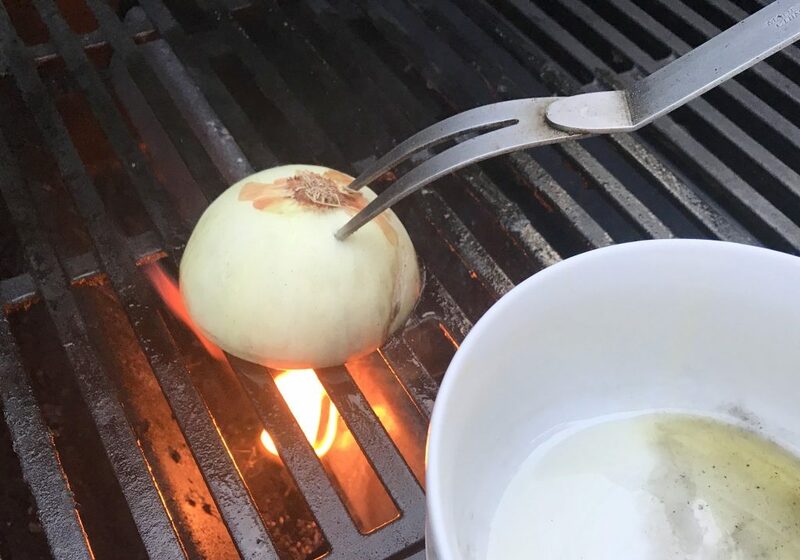 With the tongs or long fork, grab the onion and glide it across the grill to coat and season it. Put the onion off to the side or in the corner – it will add some nice flavor/smell as it cooks. 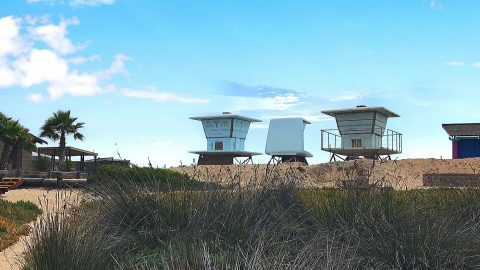 Now you are ready to place your steaks on the grill. I always prime the barbecue grill with a fresh-cut onion dipped in olive oil. Hopefully you ordered quality cuts from Omaha Steaks, but even if you didn’t these steps are good to follow. Getting the steaks ready for grilling will help ensure they cook well and retain their juiciness. Make sure the steaks are at room temperature. Starting with the cold from the frig will cause them to cook unevenly – too much on the outside and not enough in the middle. With your hands, coat each steak lightly with a little olive oil. As with any cuts of meat, there are variations depending on the size and thickness of your steaks. If there is a bone in the steak, it will take a little longer to cook. Our family likes our steaks medium rare, which is also what the majority of Americans prefer as well. My good friend Tim who is an excellent cook taught me this rule, and it is nearly foolproof for medium-rare steaks. Say it with me: Four Minutes, Four Minutes, Four Minutes. Place the steaks in the middle of the oiled grill area, and close the lid for Four Minutes. Do not touch them – just leave them be. After those Four Minutes, turn the steak over and cook the other side for Four Minutes. Whatever you do, DON’T cut into the steak with a knife to see if the inside is cooked enough. All the juices will pour out, leaving you with a dry nasty old piece of meat. If you must, prod the steak with the top of your tongs. When it jiggles a lot, it is more rare. If it moves like a solid piece with no give, it is more well done. 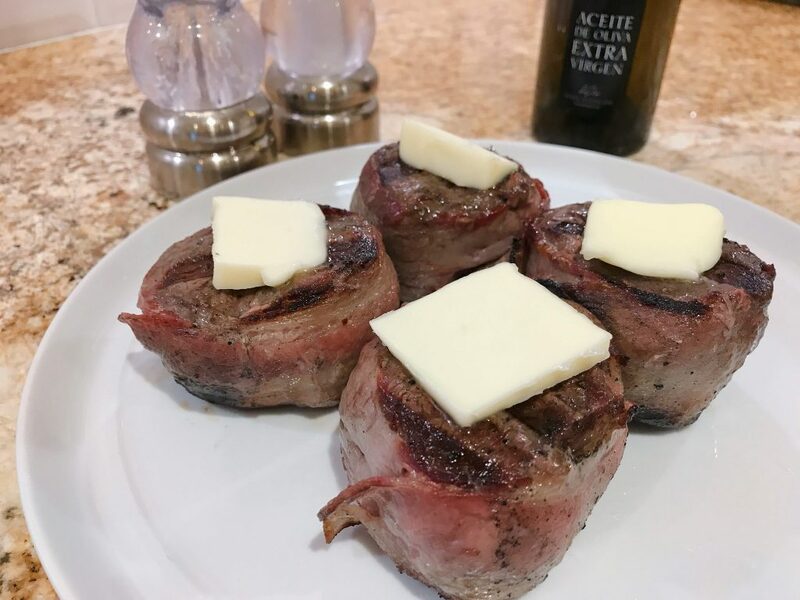 Sometimes for a little added decadence, I’ll top these delicious Omaha Steaks with a little butter. When both sides are cooked, take the steaks off the grill and place on a serving dish. Cover with foil and seal for Four Minutes. It’s important to let a steak “rest” after grilling so that the juices will stay intact. Sometimes if I am feeling decadent, I’ll put a thin slice of butter on each steak before letting it rest under the foil. So good! 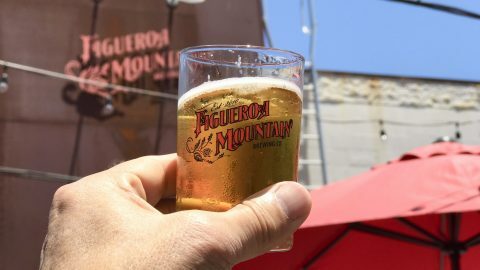 Four Minutes, Four Minutes, Four Minutes – it totally works! 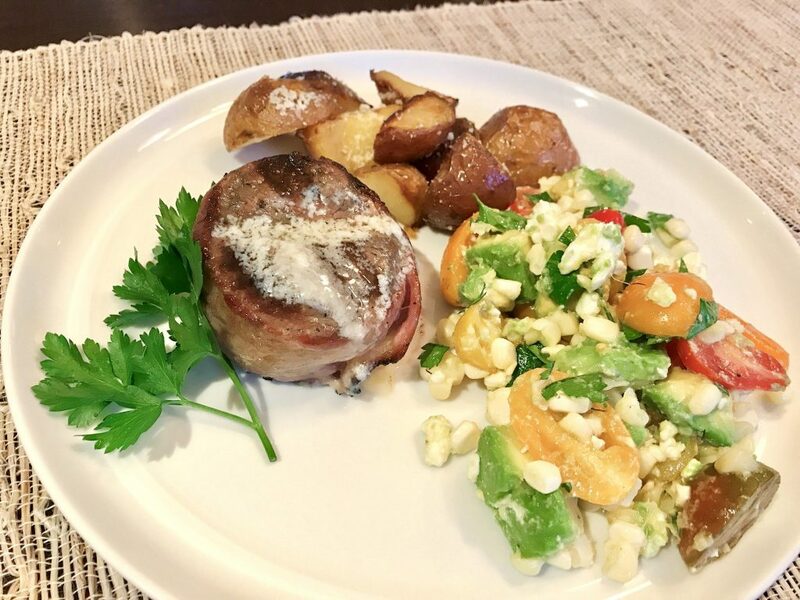 We just enjoyed this method of how to barbecue the perfect steak, using bacon-wrapped filets mignons from Omaha Steaks. They turned out perfectly cooked, and we scarfed them down with a corn-avocado-tomato salad and some crispy baked red potatoes. Deeee-lish. My pop would be so proud. Served up with some corn/avocado/tomato salad and some crispy potatoes.